Policemen from the Owutu Police Station, near Agric bus stop, Ikorodu, Lagos State, on Tuesday, beat and stripped a man for allegedly refusing to allow them to check his telephone. 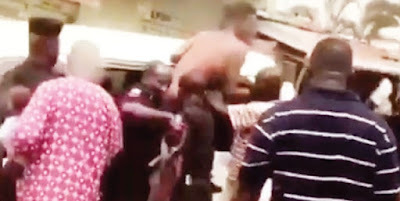 The man, who was seen calling on members of the public to rescue him from the policemen, was dragged into a white bus and taken to the station. Some eyewitnesses berated the policemen’s action, saying there was no law in the country that allowed police officers to run routine checks on people’s telephones. According to them, what the police have done is totally unacceptable as it is not their duty to search through people’s telephones. An eyewitness, Olusola Williams, said the police had no rights to halt people’s movements in order to check their phones. Williams stated that the police’s overbearing attitude had become so commonplace that Nigerians hardly knew their rights of existence. The state Police Public Relations Officer, Chike Oti, said the policemen went to a cannabis smoking spot to question some of the people they met there. He said some of the men were quietly arrested, while one fled, adding that the policemen became suspicious of the fleeing man and decided to chase after him to a shop where he ran into. Oti stated, “The truth of the case is not what you think. The policemen went to an Indian hemp smoking spot, which they call bung. When they got to the place, they wanted to get those boys for questioning. Some of them were quietly arrested but one of them fled. So, the policemen became suspicious and went after him. “He ran into a shop; the policemen attempted to take him from there, but he resisted arrest. However, the policemen applied minimum force, which they are authorised by law to apply. They were able to take him into the vehicle. He kept struggling with them and trying to jump out of the moving vehicle. They held him down. It was not as if they beat him. All the eye witnesses are talking trash ABI?